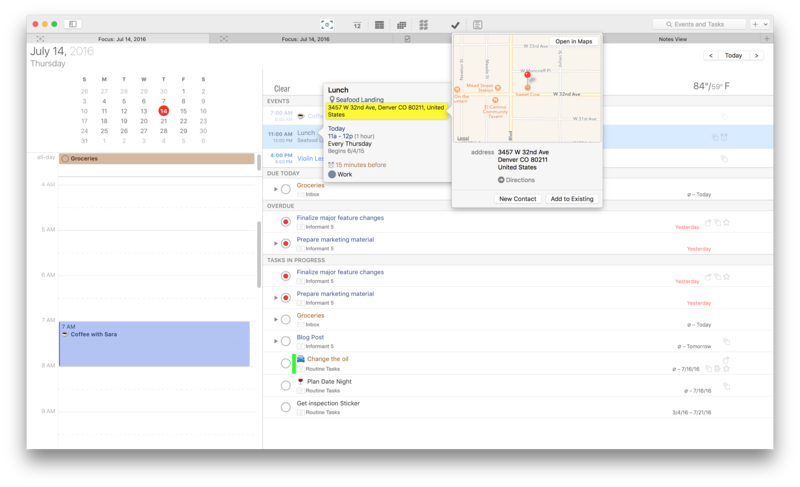 The Best Calendar for macOS is more than just a calendar. 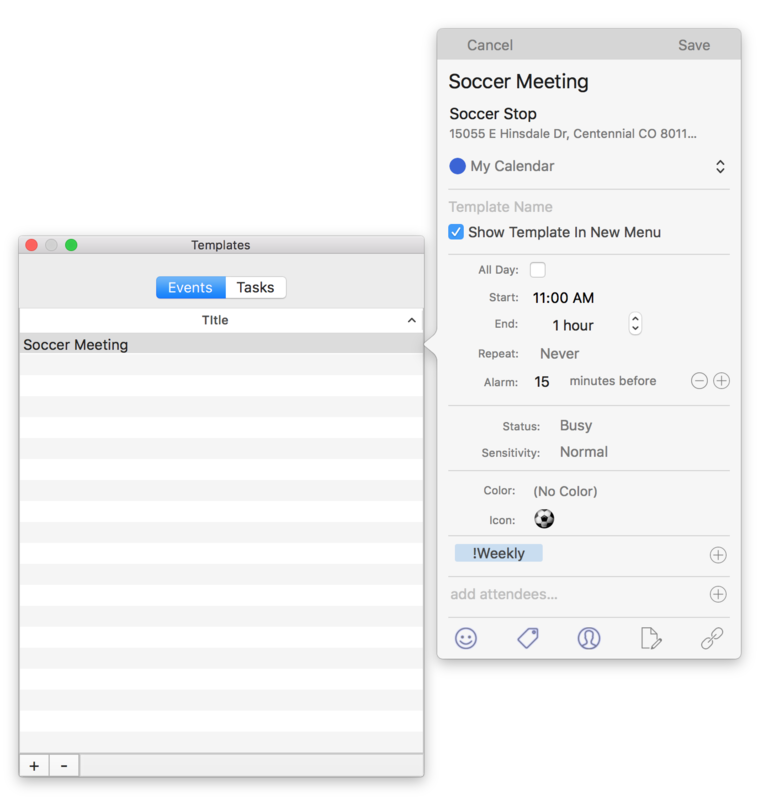 Informant for macOS is a complete planner / organizer with Calendar, Tasks, Projects, Notes, and syncs with all of the Informant products via Informant Sync*. Version 1.1 30 Day Free Trial, Requires MacOS 10.12 or better. * Sync Subscription may be required for syncing “Informant only” data. “Best Calendar App” claim is based on numerous 3rd party reviews. Your calendar and your tasks represent what you need to do and when you need to do it. Informant brings them both together in a single view for a better way of organizing your day, week, or month. 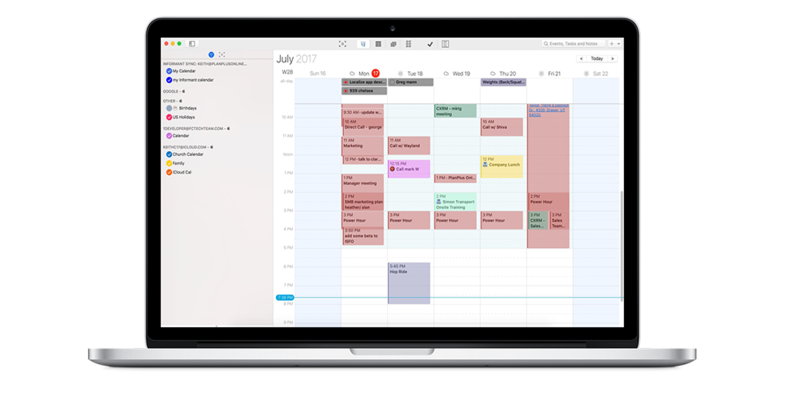 Our tabbed interface lets you work with as many tabs as you wish, with each tab showing your choice of calendar view or tasks view. Search any event, task, or note from the top right with the search field. Search options allow you to narrow or widen your search to only show what you need. Elegant and powerful. Synchronize with Informant Sync, Toodledo, and Evernote. Our Rich Text Notes editor lets you record audio notes and style rich text notes to your hearts content. Organizing tasks into projects is an effective way to manage more complex activities with features. 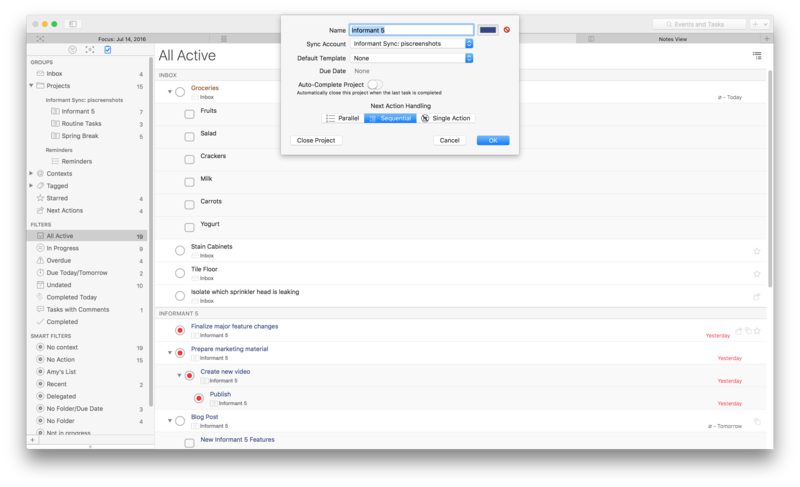 You can manage Apple reminders lists, or use Informant Projects for more powerful features including start & end dates, tags, checklists, sub-tasks, and contexts. Tap on the Informant icon in the menu bar to quickly bring up a “Focus View” and see what’s happening at a glance. Pick any date you want to display, and enter new events or tasks using the Quick Entry line. Setup a hotkey to bring up our Natural Language Entry-based Quick Entry screen and create new events or tasks as quickly as you can type them. Drag the popover and it detaches into a calendar window you can have running all the time. Smart Filters are a powerful innovation unique to Informant. They let you create your own filters for tasks with a powerful rule editor – similar to how Apple Mail filters work. You can create filters for tasks in a specific project with a status or specific importance. Whatever you are looking for – our Smart Filters can help you organize your tasks! You can trust Informant with all your daily tasks. With Quick Entry, adding tasks is a snap. Filter, group, tag, and categorize your tasks however you like. Includes full support for projects, contexts, subtasks, checklists and multi-level subtasks. Drag and drop events and tasks to any date on our side-bar mini-month or in the calendar views; events to new calendars; tasks between groups or to a new project/tag/context; and more! Templates let you quickly create an event or task. For example create a Soccer template with a preset title, icon, time, calendar, and tag. See It! Set Projects with with a default sync account, templates, due date, and three different project types: Parallel, Sequential, or Single Action. See It! …Informant Sync, Google Calendar/Tasks, Toodledo, and Evernote. Access your Mac’s built-in Calendar and Reminders for perfect integration. Color your calendar days to indicate days without using an event. Assign a specific color or icon to an event, task, or note to make it stand out or indicate something special. Gives you direct access to phone numbers, addresses, and links to access macOS’s native Maps, Contacts, and Safari viewers. See it! Assign shortcuts to Quick Entry and quickly create new events or tasks using your natural language entry – or create new Notes at any time. Using Google Calendar – Informant can add and notify attendees of meetings. Informant for macOS 1.0 is here. If you downloaded one of the pre-1.0 versions, you can see the changes that were made leading up to this 1.0 release. The Today/Focus menu is now a “tear off” menu. You can open it from the menu bar, then drag it to wherever you want. You can edit this Today tear off in the Preferences>>Focus. We have standardized on the term “Projects” for both notes and tasks. Before, we would inconsistently use the term “Notebooks” or “Projects” when you were on the Notes view. Projects can now be designated as allowing “Notes Only”, “Tasks Only” or both. Certain sync accounts only support specific data types, so in those cases, the editor locks you into a single choice. Likewise, Toodledo only supports mixed projects, so the editor restricts Toodledo projects to “both”. Informant Sync supports projects being in any of those 3 states. 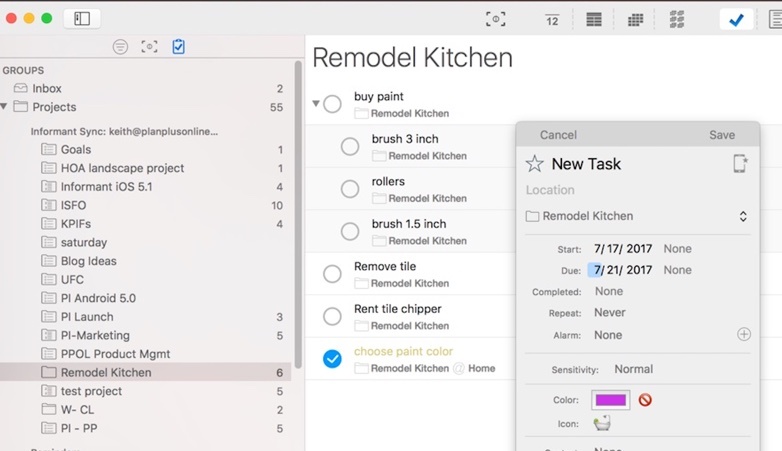 When a project is “Tasks Only”, it will not show at all in the Notes view (and vice-versa). Completed checklist items always show regardless of your “show completed tasks” setting. This is consistent behavior with Informant on iOS. Parent / child tasks are treated more like “sub-projects” now. If you set a parent task to “Active”, then the first subtask will become the Next Action. Click here for a list of remaining differences in functionality between Informant for macOS (milestone 8.5) & Informant for iOS. Frequent updates with new features being regularly added. Separate Beta/Production Releases being made regularly. Download Informant for macOS Today! 30-day trial to whet your appetite!